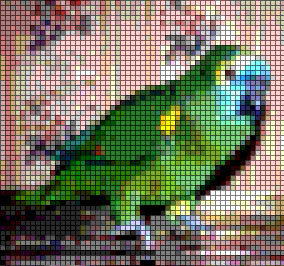 It is very easy to convert a photo to a counted cross-stitch pattern in Adobe Photoshop. The hardest part is choosing the embroidery floss colors to use once you're done. You can find out which floss colors to use by browsing to Stitch Stuff's website. They have an online chart of DMC colors and their RGB values. Simply find out the RGB value of the colors you are using in Photoshop and match it up with the DMC colors on the chart. Here is an example of Charlie, my Amazon Parrot. You will need a fairly large picture (640 x 480 or larger) to get a good quality pattern. You can use any photo you like and modify as desired before converting to a cross-stitch chart. Ready to get started? OK, let's get to it!